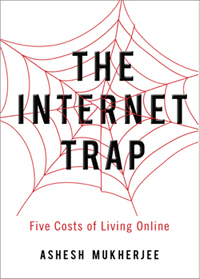 In his latest book, The Internet Trap, Desautels Professor Ashesh Mukherjee uses his latest research in consumer psychology to confirm what most of us already suspect: the Internet has changed our lives, and not always for the better. “There are so many things happening – from fake news to privacy issues. You can see the Internet is creating problems at the societal level and at a personal one, and people are wondering what the big picture is,” says Professor Mukherjee.